Well in case you don't already know, we kinda like our red sox.. like a lot. when they are playing a team near us..
for her when he got home from work and when he got home he gave her the tickets. her dad gets excited for so she knew what to look forward to all week. I was sitting in the driveway while Lexi rode her bike..
Ty yelled to Lex "are you excited for the game tomorrow? who do we get to see.."
from the games we've been to or seen on tv..
anyways Lexi proceeded to say she wanted a photograph with him. ohh the lovely age where you think anything is possible..
we have been to a billion games and you hardly even get close to the players..
let a lone get a picture. so I tell her to go tell Dad..
of how she wants a photograph with big papi..
and I proceed to tell him no.. she wants a photograph. a couple of weeks ago /months ago?? and asking/reassuring herself he's a nice guy? He likes lexi's (kids)? cool enough and the equivalence of getting your picture taken with Cinderella at Disneyland. 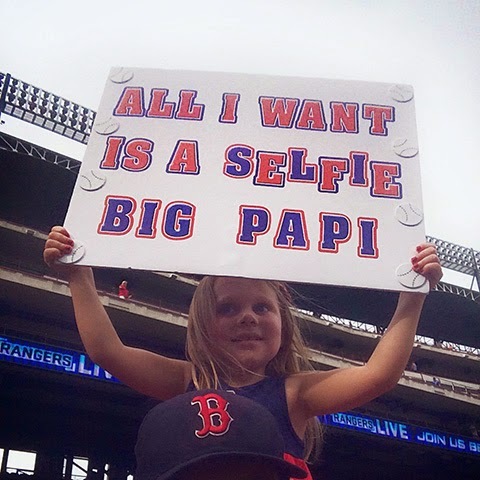 decides we should totally make a sign for Papi and "maybe". so we headed to Michael's at 8pm to get the supplies and we were pretty pumped about our idea. Lex fell asleep in the car and we had what felt like a little date night just the two of us..
since she was out in the stroller. 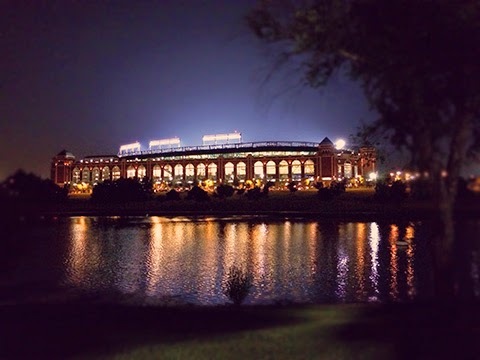 So obviously Tyson likes to get at the games as early as you can..
game starts at 7:05.. we're there at 5.
because we were not alone waiting for the gates to open. acknowledged us and the sign we knew we had a slight chance..
i mean how can you say no to a little girl with a sign?? "will you take a picture with her?" and he said yes! and then get handed off to Big Papi..
she was such a trooper!! He was soo nice and even signed a ball for us! we were completely star struck and giddy and couldn't believe this idea actually worked! How awesome is that! :) Good job mamma! That's the best!!! How fun. Love this so much! She looked so adorable getting her picture taken with him and sign. How fun! This is so so so sweet! I love it!